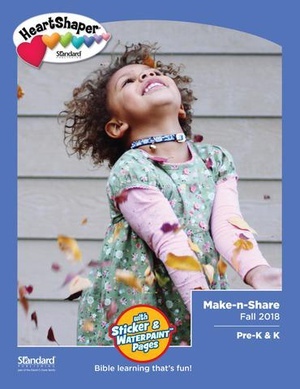 Pre-K & K children will enjoy these make-and-share activities—including peel-n-press stickers and Waterpaint™ activities—that support each lesson for kids ages 5 and 6. Building on the Bible stories and concepts taught to preschool children, HeartShaper adds more detail to Bible stories, integrates pre-reading skills, and offers simple group games. Interactive activity options provide teachers with the flexibility needed for tailoring lessons to their unique situations. This fall, preschoolers and kindergarteners will learn how God Made People, about Moses and God's People, and Joshua and God's People. David C. Cook is a nonprofit organization dedicated to publishing and distributing leadership and discipleship resources to help Christians all over the world grow in their faith and pass it on to the next generation. They call this "DiscipleShaping". They were established in 1875 by David Caleb Cook in Chicago, IL. Since that time, they have published numerous bestselling books from The Picture Bible to Crazy Love by Francis Chan, developed over ten lines of Sunday school curriculum, and published many of today's most popular praise and worship songs through their music division, Kingsway.